With a total lack of forex fundamental news the euro vs dollar has been reacting to the BASEL III agreement and the weekend’s Chinese economic data which has resulted in a strengthening of the Renminbi, following some judicious arm twisting from the US. 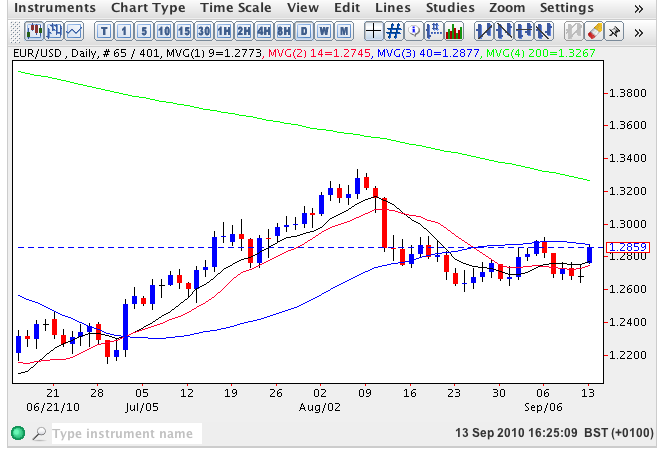 Sunday’s gapped up open for the euro vs dollar was finally followed through in this afternoon’s US session which has taken the pair to USD1.2863 at time of writing as it now begins to run into resistance on the daily chart at the 40 day moving average. Friday’s doji cross candle hinted at a possible reversal once again for the euro vs dollar, but the extent of today’s rebound is somewhat of a surprise but given the dearth of any fundamental news not entirely unexpected. As such it represents an ideal opportunity to enter short positions on the expectation of a move lower in due course and certainly below the USD1.2787 threshold established in late August where the recent sideways consolidation began to take hold. Any further rebound higher is likely to stall either at USD1.2916 or marginally above US1.3007, at which point we can expect to see a resumption of downwards pressure and a break below the psychological USD1.26 price point in due course, followed by a test of USD1.2397 and USD1.21 thereafter. All this week’s forex fundamental news can be found on my main forex trading site.